Simply the best property we have stayed in, and we have stayed in a great many! First impressions? Beautifully presented, clean, fresh, very well equipped and even better than the photos. Fabulous location with great views. Very quiet residential area but still only a few minutes in the car from bustling Javea. The completely private garden which is fully enclosed. As is the pool which is a consideration with children around. The villa itself has obviously been recently decorated and is very smart. The equipment is all of very high standard as are the furnishings. All rooms are air conditioned and very comfortable. The naia ( conservatory ) is great and we particularly liked the light and airy feeling there. This villa is perfect for almost anyone – family or couples. Well situated for Javea, Moraira, Denia and forays into the hills. It is also almost equidistant frim Alicante or Valencia airports. Thoroughly recommend Arenal beach in Javea for little ones. Lots for them to do including hiring bikes or pedal karts by the hour/ day. For grown ups, we recommend the roof terrace bar at The Beach House in the port area. The old town has a great market on Thursdays. We would definitely recommend Villa Granadella to everyone. A real home-from-home in the sun. We hope to return there again. 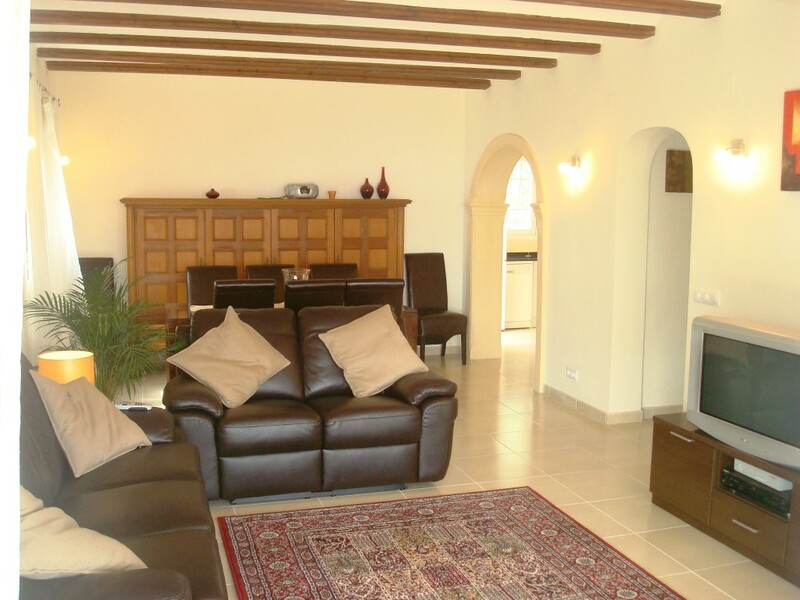 We rented this lovely villa for 2 weeks over the Christmas and New Year period. We drove down with our dog. Some friends flew in to spend Christmas with us. Then on Boxing Day our Son arrived with his family for New Year. It is a lovely villa with all the home comforts a family needs. Airy and bright, clean and comfortable. The air conditioning provided us with enough heating during the evening. Unfortunately the pool wasn’t heated so we couldn’t use it. The weather was very kind to us and we enjoyed sitting by the pool and spent many hours on the Naya. The communication with both Mark, the owner and Tricia his manager was first rate. Instant response, informative and helpful. Thank you for letting us stay at your lovely property. We felt it to be good value for money and wouldn’t hesitate to recommend it. We stayed here in August 2018 and we loved it. The property, the views, everything was amazing. Mark was very accommodating and any problems we had were quickly overcome. The pool is larger than expected and the sea views are absolutely stunning. I would definitely recommend this property to anyone. We were a family of 8 ranging from the age of 63 to 10 and everyone enjoyed themselves, in fact we only left the villa once we loved it that much. We hope to return in the future at some point. This is wonderful Villa, we spent 4 weeks here in June 2018. We would give it a 5 star rating. The property is located in a very quiet neighbourhood about a mile or so from the Arenal beach area. The villa is newly decorated inside and out and has a ‘light and airy’ feel to it. Inside the Property, the kitchen is very well finished and contains everything that a family could need, there are ample pots, glasses and cutlery, along with dishwasher, washing machine and a large fridge/freezer. The lounge and dining area are fine, however when we were inside, most of our time was spent in the Naya, where we ate, and relaxed, with great views looking out over the swimming pool and sea beyond. The swimming pool and patio area are great, and the place where most of our time was spent. The patio has the sun on it from 8.00am through to 19.00, also being close to the sea there is a constant sea breeze. We used the 3 bedrooms in the main part of the house, which are all good sized, and have plenty of wardrobe and draw space. Though the property comes with air conditioning we did not need it and found that having the windows open created enough breeze in the bedrooms to keep us cool through the night. There was plenty of linen and pool/beach towels available at the villa for all our needs. We found the Wifi worked fine both in the villa and even around the pool. The property is well positioned for visiting Javea, Granadella and Moraria, there are ample restaurants, bars and cafes on Arenal beach and Javea Port as well as Moraria. We also visited Denia, Calpa and Altea. There are a number of supermarkets within 3 miles of the villa, these include Mercadona, Consum, Aldi and Lidl. There is also a small supermarket about 1 mile from the villa on the road towards Javea. Tricia and Colin who manage the property locally were easily contacted and helped with any questions we had. Additionally, on the couple of occasions we did have minor issues at the villa these were sorted very quickly. We throughly enjoyed our holiday in a beautiful villa surrounded by lovely scenic views. The villa has been recently updated and was perfect for our stay and had everything you could need and more. Ample accommodation, a comfortable setting and a fenced in pool which is a godsend with an active 2 year old. We’ll definitely be returning!! Thanks for a making it a fabulous holiday! We had an amazing week in this villa it had everything we needed. The pool is fabulous and the view is really exceptional, we have already booked our return stay for next year. Mark and Katja gave us all the information we needed prior to our stay including step by step directions. Would highly recommend. Die Villa bietet alles was man für einen entspannten Urlaub benötigt. Gut eingerichtete Küche, tolle Terasse, Wintergarten, schöner sauberer Pool, Meerblick, neuer Gasgrill, Klimaanlage, Zentralheizung, bequeme Betten, voll möbliert und ausgestattet. Alles war schön hergerichtet und sauber. Problemloser Check-In and Out durch Zahlencode. Wöchentlicher Handtuch- und Wäschewechsel. . Sehr kindergerecht bedingt durch eingezäunten Pool. Kinderequipment und Spielsachen waren vorhaben. Haben uns sehr wohl gefühlt. Tooles Haus mit Charm. Das Haus verfügt über 4 Schlafzimmer. 2 im Erdgeschoß mit einem gemeinsamen Bad, 1 im Obergeschoss mit eigenen Bad und tollem Balkon sowie eins in der Einliegerwohnung mit seperatem Eingang und Bad. In den Hof passen zwei PKWs. Alles war tipp top. Ruhige Lage und Nachbarschaft. Man braucht aber zwingend ein Auto. Fussläufig ist in der Gegend nicht viel geboten ausser andere schöne Villen. Zum Einkaufen, Strand, Restaurants, etc. braucht man immer das Auto ausser man ist sportlich und hat ein Mountainbike dabei. Excellent villa for a perfect holiday ! We had a lovely relaxing break in this villa. It is very well equipped and comfortable with everything you need for your stay. We will definitely come back and highly recommend it to anyone ! Thank you for letting us stay in your lovely villa, we had a wonderful relaxing time, the weather also was very kind to us. Just to let you know that we have returned from a fantastic 2 week stay in your lovely villa. It delivered as promised and ticked all our boxes for our requirements: Peace and tranquility in a stunning location and in a well-appointed villa. The area is outstanding with amazing places to visit, but for myself and Debbie it was mainly about kicking back and relaxing from a very hectic lifestyle. Perfect. Villa was superb had an amazing holiday/ thank you. Thank you for owning such a lovely villa and allowing us to stay. We love Javea and Pete and I have decided to go back to Javea in September/October for 6 -12 months. We had a lovely stay thank you .The views were outstanding ,the pool lovely. Very peaceful and a great villa. We have now returned after spending a week in your villa with a lovely pool and the most amazing view. Your travel instructions were very helpful and we found the villa without any problems. Mark we have had a fantastic fortnight in your beautiful villa and my daughters wedding could not have been better. A good restaurant we found nearby was El Rancho 3 courses and half a bottle of wine 14.95 euros could not complain!!!!!! Thank you again we will be coming again and will be recommending your lovely villa. Hi Mark , we had a lovely relaxing week, the views were just amazing from your villa, and we ate out at so many wonderful places in Javea, which is why we are returning in June, please feel free to use my quote for your page. Hi Mark, Thank you. We had a fantastic holiday and have definitely recommended you to a few of our friends with larger families. Thanks for the use of the villa last week, we all had a great time. Hopefully the villa was left to your satisfaction. Hello Mark. Just a quick message to let you know how much we enjoyed our stay at your villa. The villa was everything we could have wished for. Plenty of room for us all and very well furnished. It felt just like home from home. The views from the villa are breathtaking. We would definitely consider booking your villa again. Many thanks for providing such a fabulous villa for a week. We were bereft to have left! The surroundings and views were amazing! Thank you also for your very detailed instructions on how to get there and where to eat / drink / shop etc. These instructions helped no end! We really loved the area and will probably be in touch in the future, we will certainly recommend your villa to others. What a beautiful villa you have, we really enjoyed it. Mark , just a quick email (bit late) to say thanks very much for letting us stay at your villa . We had a fantastic 2 weeks , so much so that we were not ready to come home … We hope you were happy with the way we left the villa on the Friday morning , and that your ladies did not have too much to do … Thanks again though , and we look forward to booking with you again , if that’s ok .. This is our second visit to this lovely villa. It is in a peaceful location and had splendid views towards the sea. We thoroughly enjoyed our stay and have booked to go again in October. We enjoyed very much staying in Villa Granadella and it was certainly up to expectations and as attractive as in the photos. Your itinerary etc was really helpful especially the directions from the airport and also the full instructions for things like the parasols. It was really helpful to know that we should put them down when going out as we saw how quickly the wind could blow up although we were very lucky with the weather. The pool was wonderful and it is the first holiday when we have not bothered with the beach and been quite happy to chill by the pool. Cooking was very easy with such a well equipped kitchen and the two nights we ate out were at the Everest Spice which was wonderful! Two of the children took the car most afternoons to some of the excellent climbing spots and so everyone was happy. We’ve had a few recent really enjoyable holidays with all the family at Club Med and everyone agreed that this year’s holiday in Javea was just as relaxing and the food nearly as good! I hope that we will be able to return at some point and thank you again for all your helpfulness and amenability. Me and my family have now been coming to stay at this Villa for three years during the Summer. Ideal for families and couples. There are many sight’s within easy reach of Javea i.e. Granadella Beach, Denia , Caple and Valencia. We recommend eating at Pizzaria Pepa in Javea and Badal in Calpe. Would highly recommend staying at Villa Granadella!! Hi Mark , I just wanted to say thank you for the wonderful week we had at your villa. It really was better than we could imagine, the views were great, the inside was so spacious and so well equipped. Our little two year old girl loved the exciting castle and we all loved the pool and outside area. Thank you and maybe we will return again! Just a quick e-mail to say how fantastic your villa was and how it far exceeded our expectations. Just to say we all enjoyed our stay at your lovely villa. The views were great and we loved Javea and the men enjoyed the local Golf Club as well. We have had a great time in your villa this week and we’ve kept your details for next year. Andy May 2013. We would like to thank you and Trish for making our stay so enjoyable in your lovely villa. The villa is very well appointed with everything you could need on holiday, you have a lovely villa with the most amazing views. Sorry only getting chance to catch up from our holiday. We had a wonderful time, the location was great and the sea views fantastic. We would highly recommend this villa, inside your layout is lovely and its very peaceful. We would love to come back, perfect place to relax and wind down. The boys loved it too, they were never out of the pool. Also Tricia was our ‘Knight in shining armour’ literally. We had a flat tyre at 5pm the day we arrived when everywhere is closed! She was brilliant, ferrying me to a supermarket and then the following day to a garage to get new tyre. So thank you once again and please pass our regards on to Tricia. We will hopefully book again with you sometime in the near future. The Service and engagement with the Owner of this villa was excellent, with really useful instructions and directions. The location of the villa was absolutely amazing, a quiet hideaway with fantastic sea views, from the pool, the patio area, the naya, and the roof terrace The quality of the fixtures and fittings were of a very high standard and the luxury of WiFi and Sky television was a bonus. The pool was large and surrounded by copious amounts of chairs and loungers which was lovely to while away the hours in the glorious sunshine. We enjoyed our stay so much I’m sure that we will return to the villa within the next year. A truly lovely holiday, thank you so much. This is our second time in the villa, I don’t want to say too much about it as the more people know about it the less chance we have of it being available for us! It has everything anyone could ask for and more. Its well equipped and has ample room for everyone. Its situated far enough away from the beach to give a secluded feel to it yet not too far away for access to places to restaurants, shops, banks and the beach. The views are just fantastic especially from the main bedroom with the small balcony which provides an even further escape, providing a tranquil place to relax in peace. The villa has a special atmosphere and I know that it will be difficult to even entertain the thought of even just looking at another villa never mined renting one. I didn’t want to leave and am already thinking about next year but this time hopefully for two weeks. The instructions that Mark provided on how to find the villa from the airport were excellent. The only slight improvement I can think of is to provide a little information of places of interest for days out like water parks, trips into the countryside or boating trips etc…. Hi Mark, I just wanted to send you an email to thank you for using your villa. The villa is lovely and we all had a lovely time. I left a note for Tricia as we broke 3 or 4 wine glasses but we have replaced them with 6 new ones. Our family really appreciated the villa with the layout meaning we were all close but had our own separate areas. The naya was lovely with the view of the green hillsides and then the sea views. We ate here on the table and around the corner the kids watched TV. It was nice the whole family being together and bonding. My friends and I all agree this was our best holiday by far. We were a little worried about finding the villa, but the information pack we received from Mark was very detailed, we had no problem at all. We would definitely return to the villa. P.S May I also mention that Linda was very helpful, and even posted back my car and house keys !! The extra high chair and travel cot were also very much appreciated. I just wanted to catch up with you to say that we had a lovely stay at your villa and wouldn’t hesitate to recommend it to our friends. It was good to have the car as the surrounding area is really beautiful. We managed to relax totally in these beautiful surroundings and never had a bad meal. Marina August 2011.